Base of Operations: The M.M.M.S. 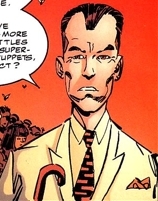 NOTE: Dr. Verlag created by Erik Larsen, with help from Keith Giffen and Victor Bridges. Dr. Verlag saw the ever-increasing freak population as an opportunity for himself and established a deal with the United States Government. He formed the Mutate Manpower Management Service which saw super-powered criminals enslaved using technology, turning them into thugs for hire. This first incarnation of the M.M.M.S. was dismantled thanks to Freak Force and Chelsea Nirvana and her Henchmen. When CyberFace seized control of the Earth, Dr. Verlag fled to Australia where BrainiApe and he forged a partnership, now using the Brain-Trust to control their prisoners instead of technology (keeping them hidden from CyberFace). Following the death of the Brain-Trust, Dr. Verlag’s slaves were liberated and the Inhabiter crushed him to death.